Nestled in the Shenandoah Valley in North Western Virginia, Serenity Cottage is a gorgeous scrapbooking retreat house and the ideal destination for weekend crops and your crafting group. The spacious cottage and scrapbooking retreat is set among a beautiful forest at Bryce Resort, a four-season ski and golf resort. You and your friends can't help but relax in the tranquil beauty of a Virginia mountain setting and enjoy the pleasure of a well-kept, charmingly decorated cottage, while scrapbooking in comfortable, well-appointed surroundings. This amazing house is more than a typical "rental house". It is filled with love, care and beauty and is truly much more than just a scrapbooking retreat. It is a home to enjoy with surroundings to help you relax and be comfortable, and it is a place to have fun! There is no better place to host your weekend crops in Virginia! 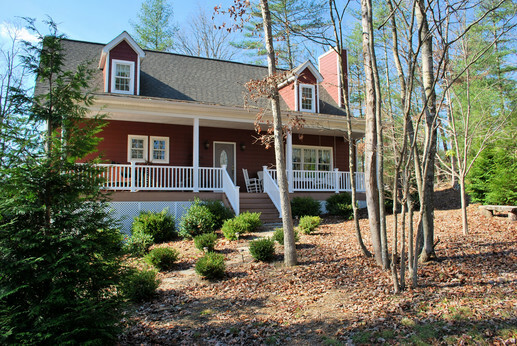 Custom built as a private family retreat in 2008 by a seasoned scrapbooker, Serenity Cottage has all the modern conveniences, charming decor and thoughtful personal touches that will have your group saying, "When can we book our next scrapbooking retreat here?!" The cottage has 3 floors, four sleeping areas, which sleep a total of 10 people, great room/dining area, three and a half baths (full bath on EACH floor), fully equipped kitchen and level parking for six to eight cars. You can also lounge on wicker on the huge screened porch, or rock and swing on the open-railed front porch. Serenity Cottage is a place you'll want to return to time after time! So gather your friends and book your weekend crops right away! You deserve it!